If you listen to the radio at all, you've heard One Republic's single "Apologize." It was number one on the pop charts in December and even my friend Neal (others may know him as "Kegstand") who never ever listens to music recognized it when it was playing in my car. It's hard to miss when every shopping mall seems to be playing it in their stores. Anyhoo, they're coming to Boston tomorrow, Friday 2/1 for a concert at Paradise Rock Club. I tried checking Ticketmaster/Livenation and you can't seem to buy tickets there - so either the concert date is too close to buy tickets online or they're sold out. Check for yourself (here). The website says tickets are $16 in advance and $18 at the door, so for those that really want to go, try calling Paradise and ask what's up. Otherwise, you can always go the evening of and I'm sure someone will be scalping tickets. PS. Here's the music video for their new song "Stop & Stare"
After the Celtics take out Dirk "Diggler" Nowitzki and the Dallas Mavericks head over to Hurricane O'Reilly's around the corner and join the Celtics Postgame Party. What I thought it said was that the Celtics are going to take Dirk Nowitzki and the Mavericks out to Hurricane O'Reilly's after the game. But upon re-reading, I realized that's not the case. Anyway, if you're interested in beer, autographs, or hot women in green halter tops and mini-skirts (or perhaps all of the above?) - head over to Hurricane O'Reillys tonight. The party starts at 10pm. Click (here) for a link to the official Celtics site for this event. Mrs. David Beckham will be at Saks Fifth Avenue on January 30 to celebrate dVb by Victoria Beckham. The line was produced by Beckham and Western Glove Works, the company behind 1921 jeans. Click (here) for the Globe's interview of her last week. I dunno, she doesn't really do it for me. I was more excited when Adriana Lima was here a couple weeks ago. Mayor Menino and Mayor Bloomberg finalized their "friendly" wager on the Superbowl yesterday. The losing side will donate the following to local charities in his counterpart's city. 100 servings of Stonyfield Farm Organic Yogurt. Sell Sell Sell. Do it while you can - before we sink into recession. A couple of pretty big deals just took place this past week. The Alexandra Hotel and some clubs on Landsdowne have been sold. First off, the Alexandra Hotel. You might know it as that burned up/ugly building in the South end on the corner of Mass Ave and Washington Street. The buyers? The Church of Scientology. In an effort to remain PC, I'm going to reserve any personal feelings I have on Scientology - but for those of you that are curious, here's a link to some information about it on wikipedia (here). The good news is, after almost a decade of just sitting there and decaying, hopefully the new owners will take over and renovate the building so that it's once again habitable. Click (here) to read the Globe article. Second, Axis and Avalon have been sold by Peter Lyons to the House of Blues. I blogged about the renovations on Landsdowne over six months ago (here). Now the renovations are in full swing but when they're done - the outcome will be a new House of Blues, not the Landsdowne Street Music Hall. Renovations aren't scheduled to be done until the end of the year. Click (here) for the Globe blurb. I don't drink champagne very often (not enough to celebrate), but when I do - I'm usually drinking Clicquot. That's about as expensive as my tastes run when it comes to the bubbly. I've never had Dom or Cristal. Last week, Veuve Clicquot opened its very first branded bar in the U.S. inside the Liberty Hotel. The bar is an "elegant alcove" located on the second floor of the hotel, formerly the Charles Street Jail. Flute glasses and bottles of La Grande Dame as well as full selection of current and past La Grande Dame Vintage and Vintage Rose will be available. The Boston location joins two other Veuve Clicquot bars, which have recently opened in Hamburg, Germany and Macao, China. I'm actually interested to see what the bar is like. Do they only sell that one brand of champagne? I have yet to swing by the Liberty Hotel since it opened to check it out. Has anyone been there? Thoughts? Click (here) to read the original blurb in the Boston Business Journal. PS. I always have a bottle of Clicquot in my fridge in case of an impromptu celebration or birthday that I forgot about. The cheapest place I've found it is Costco - about $37 bucks a bottle. Thanks to Bloggery Reader Skip for emailing me about this. This is the most exciting news I've read all day. First off, there is a new Chipotle opening up in Cleveland Circle on January 31st. Second off, they are doing Free Burrito Day a day early (tomorrow) January 30th from 11am to 8pm. People who come to the store between 11 a.m. and 8 p.m. will get a 20-ounce burrito and a soft drink — completely free of charge. Cleveland Circle is a pretty fun place to hang out, and now I can hop on the Green Line and get myself some Chipotle. Up until now, I've been driving out to Somerville to get my Chipotle fix whenever I go to the Costco in Everett. Yes, I know it's a chain but I really like their burritos - even more so than Anna's (I just went there this past weekend. I think I like Chipotle better). Click (here) for a link to an article about Free Burrito Day. Barbacoa burrito with guacamole, here I come. I know that they print championship t-shirts and hats and such in advance of the Superbowl so that once one of the teams win, they can start selling the shirts immediately, but the Boston Globe has taken it one step further. 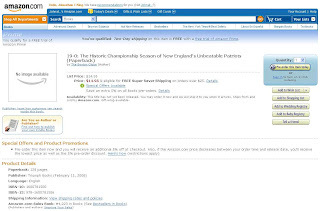 Check out the screenshot below from Amazon.com where they are apparently taking pre-orders for a book called "19-0: The Historic Championship Season of New England's Unbeatable Patriots" written by the Boston Globe. Dear Boston Globe, dont' you think you're rushing it a little bit? There's no need to put it out for pre-sale orders. Even after they win, I don't think I'll need to read about it until at least a few months later - the memory will still be fresh in my mind until at least then. Yes, I think the Patriots will win, but this is overkill. I'm still mourning the fact that it isn't going to be the Cowboys vs the Patriots this Sunday. Stupid Jessica Simpson......GRRRRrrrrr.. Thanks to Reader YJ for letting me know that there is a Giant's version also. This one is called "New York Giants: 2008 Super Bowl Champions" and it's being put out by a company called Sports Publishing Inc. Click (here) for a link to this one. Just one more update on the Alpha Omega situation. It's been sold to Tiger Capital Group, The Gordon Company, and SB Capital Group. The three groups will undergo a liquidation sale of company assets as soon as they finish doing inventory to figure out what exactly they bought. What does that mean for you and me? Hopefully a decently good sale on overpriced jewelry and Rolexes. I feel like this type of stuff rarely goes on sale, so a store closing/liquidation is a good chance to try to score a good deal. I'm still kicking myself for not getting more stuff when Filene's Basement closed in Downtown Crossing. Yes, it's not nearly in the same league, but same concept. Alpha Omega's entire multi-million dollar inventory of diamonds, fine jewelry and watches will be targeted for immediate sale at all Alpha Omega locations, which are in Cambridge, The Prudential Center, the Natick Collection and The Burlington Mall. After the sale, Alpha Omega stores will be converted into Ross-Simons stores. Click (here) to read the article from the BBJ. Late last week, Christopher Walken and Charlize Theron were chosen as Man and Woman of the Year by the Hasty Pudding Theatricals. According to tradition, each of the honorees will take turns parading through Harvard Square. Ms. Theron will be here on February 7th and Mr. Walken will be here the week after on February 15th. To order tickets to the Woman of the Year roast or Man of the Year roast and show call 617-495-5205. Click (here) to go to the official website and get more details on the winners. On Feb. 6th, the Harvard Lampoon will present Paris Hilton with an award better than or equal to "Woman of the Year" outside the Lampoon Castle. All are welcome to attend. On yet another slightly related note, Paris is going to be at The Estate on Wednesday night after she gets honored at Harvard. Apparently, she's in town to promote the new movie she's in "The Hottie and the Nottie." I saw the trailer, it's horrendous. 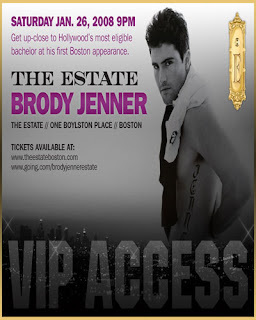 I do have to give The Estate some props, they had Brody Jenner this past weekend (semi-celebrity) and then in Feb, they'll have Paris - another semi-celebrity. It's nice that they're putting forth the effort to get some celebs in town. Here's the latest in the Jasmine Sola soap opera. If you haven't been keeping up, click (here) to read a synopsis. The founder of Jasmine Sola - Luciano Manganella - has picked up the leases for 5 of the former Jasmine Sola locations and will be reinventing them as "Mix and Company"
Mix will sell the brand names - including Splendid, Free People, and True Religion - that attracted Jasmine customers, , but carry significantly less denim. Mix also will feature departments for active wear, swimwear, and intimate apparel. New names will include Hanky Panky, Cosabella, Scanty, and Honeydew Intimates, said Manganella's wife, Stacey Manganella, who works as Mix's head merchandiser. Keep an eye out folks. Mix stores will open up in March. The chain open at the former Harvard Square or Comm Ave locations. But Mix will take over shops in the Pru and on Newbury Street. Super hungry is pretty much how I'd describe myself these days - I'm trying to cut down on carbs and it's not very fun. Super Hunger Brunch is just what the doctor ordered. 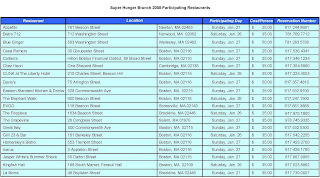 Spanning this weekend - Saturday and Sunday (1/26-1/27) - a bunch of Boston-area restaurants will be hosting a price-fixed brunch to benefit the Greater Boston Food Bank. Too bad my favorite brunch place - Metropolis Cafe - isn't on the list. But there sure are a lot of great ones. See below, make a reservation, and then come back and let me know how the food was. Go out and stuff your face, it's for a good cause. Click (here) to go to the official Super Hunger Brunch site. Lifehouse is coming to Boston March 28 along with Matt Nathanson and honeyhoney. Presale tickets go on sale tomorrow, Friday 1/25 at 10am EST and will end at 5pm EST. Regular tickets will then go on sale to the public on Saturday 1/25 at 10am EST. House lawmakers have approved a bill banning drivers from talking or texting on cell phones while behind the wheel. From here, the bill goes to the Senate. Time to get a handsfree headset if you don't already have one. Those will be exempt from this bill. I recently got the Cardo Scala 700LX from amazon.com. I've been using it for about three weeks. It has worked out pretty well. According to cnet, the Aliph Jawbone is the best headset out there right now, but I didn't feel like shelling out $100 for a headset. Adult drivers would face $100 fines for the first offense and $500 for a third offense. Those with junior operator licenses would face fines and the suspension of their licenses. Dunkin Donuts has launched it's own channel on Youtube and is currently sponsoring a contest where the top 50 creators of the best videos to show "How do you keep America running?" will win a year's supply of coffee. So if you've got a webcam and a little bit of creativity, keep the cameras rolling. After you win, let me know how much a year's supply of coffee is. A cup a day? 3 cups a day? Or maybe it's just a lot of beans. Through March 1, Canton, Mass.-based Dunkin' Donuts are hoping people will craft videos and post them on www.youtube.com/dunkindonuts. A panel of judges will evaluate the submissions, and visitors to the site will also rate the videos to determine the winners. Happy Hump Day everyone. Who's going to brave the cold tonight to grab a hump day drink? Mullins will perform songs from his forthcoming CD Honeydew set to a special laser show under the Planetarium’s stars. I've never heard of the guy, but based on his website he sounds to me like a country'ish type singer. Click (here) to visit his official website. I just received word that the Shawn Mullins concert is NOT open to the public. I was originally told that it was a free event and now I'm being told it's only open to contest winners. Sorry everyone. Please don't shoot the messenger. Looks like we're in for some more movie filming coming up soon. Martin Scorsese will be filming a movie adaptation of Dennis Lehane's book "Shutter Island" in Boston starting in March. Coming up this Saturday, Jan 26th will be an open casting call. The movie which is currently called "Ashecliffe" is set in a 1950's mental institution with flashbacks to a World War II concentration camp. The film will star: Leonardo DiCaprio, Michelle Williams, Patricia Clarkson, Ben Kingsley, and Mark Ruffalo. Grant Wilfley Casting is opening a satellite office in Boston for the feature film ASHECLIFFE directed by Martin Scorsese and starring Leonardo DiCaprio. Filming begins in the Boston, Mass. area in March 2008. An open call will be held from 10am to 4pm on Saturday Jan. 26 at Boston University (George Sherman Union- Metcalf Hall) 775 Commonwealth Ave. Boston, MA 02215 to cast extras for the feature film. Casting for people to play mental institution staff (doctors, nurses, orderlies, guards), mental patients (including interesting, quirky or unusual character faces), the malnourished and emaciated concentration camp prisoners (many of whom will have their heads shaved), and people to play WWII American and German soldiers (young athletic types, people with military or law enforcement experience and knowledge of firearms, police officers, fire fighters, ROTC, etc). Seeking men who are willing to have their hair cut short and women with natural-looking hair color, no highlights. Specifically seeking Caucasian and African American people. If you cannot attend the open call, you can mail in a recent picture and contact information to - Ashecliffe Production Office, Attn: Grant Wilfley Casting, 51 Sleeper Street, 5th Floor, Boston, MA 02210 or email boston@gwcnyc.com. I wonder how Giselle feels about Leo spending some time in Boston. The casting call has come and gone. A few thousand people showed up. Here are a few more details on the filming: Filming is scheduled to begin in March and will last three months and will take place at Whittenton Mills in Taunton and the former Medfield State Hospital. According to the Globe, filming is currently taking place a the 42 acre Whittenton Mills complex along the Mill River in Taunton. And filming will also take place later at the former Medfield State Hospital. No, that's not a male nurse in a Shaw's parking lot, it's actor Leonardo DiCaprio on the set of Martin Scorsese's new movie "Ashecliffe." In the film, which was shooting in Hull over the weekend, DiCaprio plays a US Marshal investigating the disappearance of a murderess who has escaped from a hospital for the criminally insane (here). Man, you leave the country for one week and the whole world falls apart. Apparently, Toscanini's is in trouble, too. According to what I've been able to read, they fell behind on some taxes that they owe and have since been shut down. Anybody know how long they've been closed? I haven't eaten at Tosci's since my college days, but a local institution is a local institution - it's sad to see you go. The owner has started a website to solicit donations to help pay for the backtaxes that they owe. Click (here) to go to the website. So far they've raised $13K+ and their goal is to raise $25K. If you're in the giving mood - head over to their website and make a contribution. I won't be donating because as you've admitted on your site, it was your responsibility to pay the taxes, and I don't feel that the burden should fall on others to pay your bills. However, I do respect you guys as a local Boston landmark and wish you the best of luck on your journey to get things back in order. Nothing screams recession like businesses going under. First Jasmine Sola (upscale women's clothing), then Alpha Omega (luxury watches/jewelry), and now Domain (upscale furniture). According to today's globe, Domain has filed for Chapter 11 bankruptcy after "a months-long struggle to find new investors as sales decline." Good luck finding investors - the worldwide stock markets are plummeting. Personally, my entire apartment is furnished with stuff from Ikea. I live in one big Ikea catalog. Except for my couch - that one's from Jordan's - but only because the couch I wanted from Ikea was sold out and I didn't want to wait. When people don't have money to spend, high-margin luxury products like jewelry and furniture are going to be the first to go. Click (here) to read the Globe article. Click (here) for the latest article on the Domain saga. If i wasn't in a different country, you'd most likely find me at the Natick Collection this Friday, standing in line for a chance to meet Adriana Lima. She'll be at the Victoria's Secret in Natick doing an autograph signing from 5pm to 7pm this Friday 1/18. PS. For all the single guys out there. I read in the latest issue of Esquire that she's single. As Barney would say, "Suit UP!" Did I ever mention that I started a group on Facebook for Beantown Bloggery readers? Scope out the other folks in the area that read the blog and support the Bloggery. If I started a bulletin board for folks to post restaurant reviews and events and such, would that be helpful? I've just been brainstorming some ideas on how to make the Bloggery better - any suggestions you guys have would be great. Click (here) to join the Facebook group. It's called "I Read the Beantown Bloggery." Maybe you can use it to meet some other Bostonians in the area. Guy 1 - "Hi, I noticed you read the Beantown Bloggery"
Girl 1 - "Yes, it's an awesome site." Guy 1 - "I agree. Look how much we have in common. Wanna grab dinner sometime?" Good morning everyone. It's 5am in Dongguan, China and the jetlag is alive and well. I already wrote to congratulate the Pats on their recent victory, what I wasn't aware of was a new clothing line put out by local clothing company CollegeHype to celebrate. Thanks to Bloggery Reader Rebecca for sending me the info. 10% of proceeds from the "Perfection" Line will be donated to the Children's Hospital. Here's my pick of the litter - the grey hoodie. Click (here) to see the entire line and pick one out for yourself. Do it for the kids. Do it for Tiny Tim. "Please sir.....can I have some more?" Ok, I'm losing it - time to hit the showers and get ready for my breakfast meeting. Stay warm everyone - if it's any consolation, it's just as cold over here in China. I was contacted recently by local artist Ingrid Gerdes about her new cd that debuted earlier this month - The Eclectic Collection. Her email couldn't have come at a better time. I recently cleaned off all the music on my laptop to make more room for ......... more work files .... *gasp*. Yeah, I know - boring. Anyway, I just used Pandora.com to stream music while at the office. I was in for a rude awakening this morning when I discovered that Pandora is only available in the U.S. As a result, I've been listening to Ingrid's songs nonstop all morning off of her Myspace page (here) and let me tell you, it's awesome. Amy Winehouse eat your heart out. Ingrid releases her original debut album, The Eclectic Collection, in January 2008. The album mixes blues, soul, Motown, R&B, reggae, classical and pop—into one unique compilation. With original pieces, both personally written and produced, this album epitomizes her appreciation and passion for honest music. 1. Goto Ingrid's Myspace Page (here) and listen to her songs. 2. Leave a comment here with the name of your favorite. 3. Email me with your name and address to enter the drawing for one of the autographed CD's. Winners will be chosen on Friday 1/18 at Midnight EST. If you can't wait until then, you can purchase tracks or the entire CD off of Ingrid's Myspace page. I've always been a fan of local artists. When I was growing up in Dallas, I was (and still am) a huge fan of Bowling For Soup. Good Luck Ingrid - I've heard your music - and I think you're going to do great! I'm going to kick things off with my personal pick: My favorite track is "It's Too Late." Congrats to the Patriots for extending their record to 17-0 after defeating the Jaguars. I know all of you know it already and it's not news - but something really funny (and sad) showed up on my google page. I have an RSS feed that shows me the most popular search terms on Google and number 7 as of right now is "Terrell Owens Crying." It's a little sad because I'm originally from Dallas so I would have loved to see a superbowl with the Cowboys and the Patriots. But, alas I guess it won't happen this year. I didn't get to see the game because I'm in Hong Kong right now and missed it in lieu of a breakfast meeting with some clients - was T.O. crying when they lost? Anyhoo. Chargers are up next. Who's going to the Superbowl? Pats and Packers? 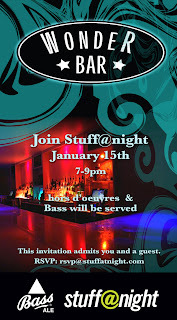 Bass Ale, one of my favorite beers, is hosting a "VIP" party at Wonderbar in collaboration with Stuff@Night on Tuesday, January 15th. Check out the flyer below for additional info. Personally, Tuesday is a bit early in the week to be drinking, but it's a "VIP" party so it must be good....hehe. Well, what New York City does we tend to follow. First it was Brookline and now it looks like Boston is following suit. The Boston Public Health Commission voted unanimously, after little discussion, to give preliminary approval to a ban that would take effect late this year if it receives another thumbs-up in the spring. I'm not really sure how I feel about this. Part of me wants the ability to eat trans fat if I feel like it. I don't like being told what I can and cannot eat by the government. The other part of me is thinking - it's not like I eat trans fat on its own. Stuff is cooked in it or with it. If that same food can be cooked to taste the same without it, then what's the harm of banning it? It wouldn't hurt for me to be a little bit healthier anyways. So life minus the trans fat would probably be beneficial. Click (here) to read the original Globe article. Sorry for the short hiatus. CES got a little crazy - nonstop meetings and very little sleep. Coming back tomorrow is the New England Boat Show. Nothing to combat recession like going out and buying a boat. =) That'll show Bernanke. Welcome to the New England Boat Show. The oldest, largest and most respected boating marketplace in the Northeast. The New England Boat Show is held annually at the new, state of the art, Boston Convention & Exhibition Center (BCEC). With more than twice the available space of any other exhibition hall in the state, this is truly an event that the boating enthusiast will not want to miss! The show combines over 500,000 square feet of exhibit space and ceiling heights to over 90 feet. See Powerboats and fully rigged Cruising Sailboats to 50 feet. The New England Boat Show also has over 350 exhibits of marine accessories for your boating needs. The show starts tomorrow, Saturday 1/12 and runs until 1/20. Have a good time folks! Click (here) for the official link to the show site. Apparently CES attendance is way down this year. I don't know the exact number (too lazy/tired to Google it) but you can tell from the fact that the halls are not nearly as crowded as they were last year. Don't get me wrong, there's still a lot of people here. But last year it was like trying to maneuver through a nightclub - people were packed in like sardines everywhere you went. 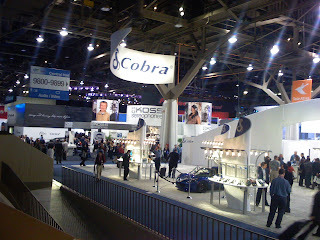 Anyhoo, below is a picture of a typical shot of the convention hall at CES. Companies spend lots of money making their booths look nice. They also hire pretty women to wear skimpy outfits to stand in their booths. It's a little sad. Sorry, no pics of the women in skimpy outfits. There's already plenty of websites on the internet that specialize in that. And below I have a picture of something that I thought was pretty neat. Not breathtaking or anything, but neat. I've been in nonstop meetings everyday so I haven't had time to scour the floor for cool stuff, but hopefully I will tomorrow. So everyone and their mom has noticed the surge in the digital photo frame category right? Everyone sells them nowadays. 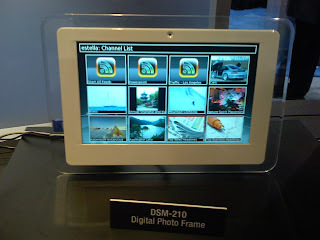 The one below is a wifi digital photoframe from D-Link. Basically what it allows you to do is to upload your digital pictures to a website like flickr. Then, this photoframe can stream your photos off of the website. How would I use it? I could set up one of these photoframes to stream pictures from my website and then I'd mail the frame to my grandparents (they're not very tech savvy). Then, I could upload new pictures to my online photo album anytime and my grandparents would automatically be able to see them on the photoframe. I think that's a pretty neat idea. I'll keep my eyes peeled for stuff that's a little more exciting tomorrow. Beantown Bloggery Reader Vicky had a question to pose for everyone about greyhound racing in MA so I've put up a new poll on my page. After the casino poll from a couple weeks ago (here) she just wanted to know how everyone felt on the issue. This is a question that will be on the 2008 ballot (I hope it passes due to the treatment of the animals). We collected over 100,000 signatures in 9 weeks and will be collecting 11,000 more between the end of May till the end of June. I am just curious how people view the issue. Help out a fellow Bostonian and cast your vote, the poll is on the upper right hand corner of the page (here). I usually read multiple newspapers each day so that I can find Boston news to share with everyone. Unfortunately, a wrench gets thrown in the system when I have to travel for work. But often times, folks send me emails about events that they know of and events that they are holding/attending. SEND ME EMAILS. Without papers to read, I'm relying on you guys to send me news on what's happening in Boston until I return. Alternatively, if ya'll would like to hear about what's going on in Las Vegas this week (I'm here for CES - the Consumer Electronics Show) or Hong Kong next week (business meetings overseas), then let me know. I'm more than happy to shift gears temporarily. Here's a couple pics of the coolest item from CES last year. Sony's OLED tv - I've been told that there is one on display at the Sony store in Copley right now. I think they just started selling in Japan and pricing was about $2000 for an 11" tv. The tv is pretty amazing though, only a few millimeters thick and the colors are absolutely radiant. Beantown Bloggery reader Jim sent me the funniest comment thus far on my post about my New Years Resolutions (here). If I were drinking something when I read his email, I probably would have spit it out all over my laptop. Unfortunately, he emailed it to me instead of posting a comment, so I'm going to post it here for everyone. I think you should enjoy yourself for the first 11 months and then lose 25 lbs the 12th month. You can do it ! Happy New Year ! Jim, I appreciate the faith you have in my ability to lose weight, but the only way I would lose 25 lbs in one month is if I spent all of month 12 working up the nerve to cut off my arm. I love member referrals, mostly because it's usually a win-win situation. The referrer gets some sort of bonus and the referred gets some sort of discount. 62 Boylston is an apartment building downtown right across the street from the Boylston T stop. It's right above that Starbucks on the corner of Boylston and Tremont. For those of you currently looking for an apartment downtown it's a really convenient location. FYI - the building only has studios and 1 bedrooms. So right now the resident referral bonus is $300 for residents. That means that if someone in the building refers a new tenant, that person gets $300 subtracted off the rent for the next month. How would that benefit you? Well I live in the building, so I can refer you and then I'll split the bonus with you and cut you a check for $150. It's a win-win for someone that's looking for a place to live anyway. 1. Really convenient location downtown - close to the green, red, and orange line. 3. Proximity to lots of great things: The Sports Club LA, Chinatown, The AMC Boston Common Theater. 4. Coffee junkies will appreciate living above a Starbucks. 1. No parking in the building. 2. The homeless shelter is across the street so there are sometimes questionable folks hanging around outside. No real danger to you though, in my opinion. 3. The building is full of students. Students never seem to sleep. 4. Some jerk keeps leaving bleach in the shared washer on my floor so it ruins all my clothes. 1. If you are looking for an apartment in a highrise - most of them have management offices that you can rent from fee-free. This is true for 62 Boylston. Don't get sucked into having to pay a realtor one months rent if you don't have to. 2. The studios in the building vary drastically in size from 250ish sq ft up to about 400 sq feet and the price only varies by about $50. Make sure if you're getting a studio to look at ALL of the available ones so you can choose the biggest one. Comments from me: If you read my earlier post about moving, yes I am planning on leaving this building. I just think it's time to get out of a studio and live in a real apartment. Also, my new neighbor is really loud - so there's only so much I can bear. Overall I really enjoyed my time here. The location can't be beat. I'm planning on looking for something else in a building nearby. Send me and email if you'd like to be referred and I'll contact the management office for you. We're four days into the New Year already and I'm just now getting a chance to type up my New Years resolutions. It's been a busy few days - everyone is preparing for CES (Consumer Electronics Show). Yes, I know losing weight is such a trite and overdone New Years Resolution, but I'm doing it anyway. I lost a lot of weight while I was in college, but the past three years of working life have caused me to balloon back up. I read lots of stuff on how to invest, but it never seems to sink in. For every good stock I choose, I end up choosing a real stinker. In the end I dont' make any money. I've recently switched over to mutual funds as opposed to regular stocks, but even those are hit and miss. Half a dozen of my friends are taking or have taken the CFA, so I'm going to borrow their study materials and try to learn more. No point in saving money if I end up investing it poorly and losing it. I may as well have spent it in the first place and had a little fun. In the meantime, the bulk of my money will sit in a savings account or CD's. That's it for resolutions. I'm keeping it simple 3 resolutions. I wonder if its possible to lose 25lbs in a year. That averages out to about 2 lbs a month which seems do-able. We'll see what happens. We all knew it was going to happen. After all the commotion over the past two weeks (here) we were all expecting it. No self-respecting businessman packs up his family and flees the country unless something really bad is going to happen. According to the Globe today, Alpha Omega filed for Chapter 11 bankruptcy last night which will result in the Alpha Omega's assets being auctioned off. The first bid was placed by Tiger Capital and Gordon & Co at 70.25% of the inventory cost. I wonder if I can get a good deal on a Rolex right now since the company is in turmoil. Clearly Tiger Capital and Gordon & Co will be getting the Rolex's for 30% off - I wonder if the store managers would cut me a deal since the ship is sinking anyway. For those of you that have stuff on order at Alpha Omega, or have a watch there waiting to get fixed. I'd suggest cancelling your order and/or getting your property back asap. I would feel rather uneasy leaving my money or expensive jewelry in the hands of a bankrupt company. UPDATE 1/4/07: Anyone else tired of reading about Alpha Omega? It's been three weeks - it's not news anymore. Stop printing articles. Dear Boston Globe, you're beating a dead horse. Click (here) for the latest article. Howard Zinn's book "A People's History of the United States" is being turned into a tv miniseries. And they're filming it in Boston at the Majestic Theatre on January 8th and 9th. Here's the best part, they're giving away tickets to the taping for FREE! Celebrities that will be there include: Danny Glover, John Legend, Josh Brolin, Marisa Tomei, Voggo Mortensen, etc. The list goes on. No charge to invited guests. By accepting an invitation and attending you understand that the complete event will be photographed and recorded and agree to the unrestricted use of your likeness. We will confirm by e-mail that you are invited. Incomplete requests will be denied. Reserving by telephone is preferred. I rent. As a result, moving has been almost a yearly experience for me for the past four years until this year. This year I decided to stay in my studio for a second year. I'm already regretting the decision. It's a delicate balance between my hatred of moving and the sheer pain of living in a tiny box of a studio. My last move was especially painful. Never really having had the money to pay for movers, I always did it myself via multiple carloads. The apartment building I live in now doesn't have a loading dock or anything and it's on a busy street so I couldn't double park and move. So after I finally succeeded in finishing my move, I vowed to either stay in my current apartment for many years or pay for movers the next time I move. Well thanks to the fact that I haven't been able to cook a decent meal in over a year due to the tiny and remarkably useless kitchenette in my studio and the new college students that moved in next door who party until ungodly hours during the week - I will be moving this year and will definitely be requiring the help of some moving services. Do you guys have any suggestions on how to find a reliable Moving Company? As of now I'm scouring the net for review sites. Other than Home Bulletin, I really haven't been able to find much in terms of resources to help make a decision. If you haven't been following the news on the tv front, the government has mandated that starting February 18, 2009 all tv transmissions are going digital. What does that mean? It means that if you have an old school tv, you're not going to be able to use it anymore unless you get a digital converter box. Starting today, the federal government is giving away $40 coupons (2 per household) for those above-mentioned converter boxes. The Globe has an article with some of the details of the program. Here is the part that bothers me the most. "The giveaway basically works under the honor system." No offense to society, but in my opinion the honor system never works. The coupons are on a first come first serve basis, so get your coupons early if you need them. You can be sure that scheming folks out there are going to be requesting them in order to resell them on ebay or craigslist- it's a $40 coupon after all. Click (here) to submit your application for your coupons. Click (here) to read the article in the Globe for yourself.